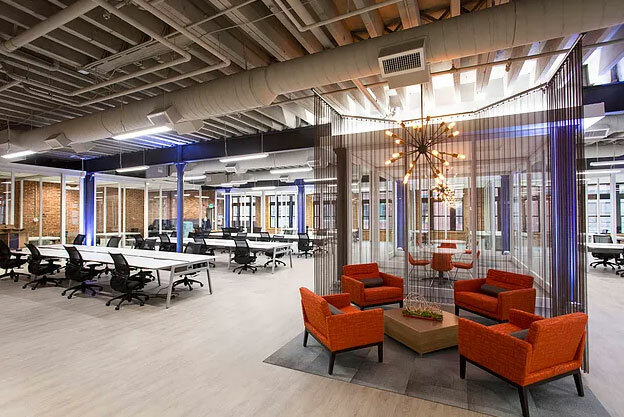 If anything about Baltimore stands out, it’s how innovative the offices can get. From the super trendy conference rooms, to the co-working spaces, Baltimore does workspaces really well. Furniture that allows workers to sit or stand while working, or even move around. Some give options to connect certain desks to one another. Making the space conducive to customization allows for more room for comfort and productivity. Spark Baltimore is a GREAT example of this brilliant idea. When startups form, many times the overhead of an office is unattainable. A co-working space gives new businesses the option to rent space out to work in. They can purchase a day pass, or a monthly membership. The choices can be a room of multiple desks and chairs, or even a separate office. Yup, it’s as fun as it sounds. Offices are integrating fun into the work atmosphere, and honestly we are pretty jealous. Imagine having a tennis court open to employees right on the work campus. It gives employees more of an incentive to come to work, and it sounds like it definitely works. Baltimore is really changing the game when it comes to working. From Baltimore office furniture allowing for unlimited customization, to having an open space atmosphere, the trends are booming. Hamilton Business Interiors stays on top of the trends for the best productivity for the work space. For any information on how to redesign your office, please reach out to us! This entry was posted on Monday, September 11th, 2017 at 4:34 pm. Both comments and pings are currently closed.